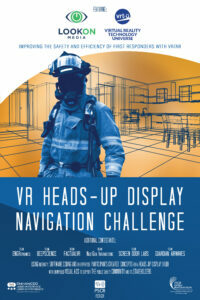 We are proud to announce that VRT-U in collaboration with LookOn Media has won first place at the National Institute for Standards and Technology’s (NIST) 2018 Virtual Reality (VR) Heads-Up-Display (HUD) Navigation Challenge for First Responders. 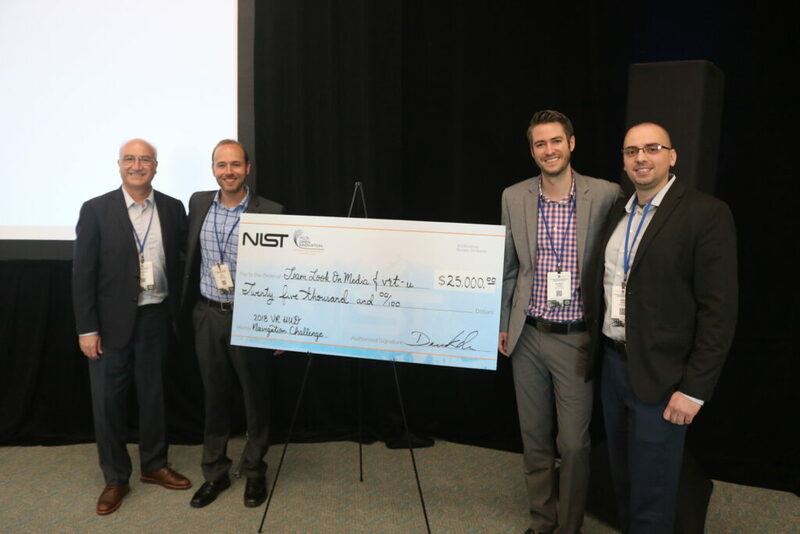 After narrowing down all competitors through four stages only six teams were invited to present at the Public Safety Broadband Stakeholders (PSCR) Annual Meeting in San Diego and to compete for a share of the total purse of $125,000. The PSCR team awarded a joint first prize to LookOnVRTU and ENGR Dynamics with both teams scoring 89 points for a wining tie. Our winning HUD solution guides firefighters to find the victim as quickly as possible and to evacuate the victim through the fastest and safest path possible. This solution dynamically adjusts the best route based on obstacles, fire hazards and other changes in the environment while safely guiding the rescue team through smoke, haze, and complete darkness. In designing the HUD Navigation UI, LookOnVRTU consulted with Dr. Paul Davis, the President of First Responders Institute, to select and prioritize the most important features. Upon seeing the demo video, his response was “This is ground-breaking!”. First responders are exposed to great risks and put their own life in danger to rescue others. Reducing that risk is the number one goal of all first responder teams. Having been able to provide a solution that improves the safety of those firefighters fills us with great pride. We look forward to continue working with the first responder community to implement solutions that safe lives.